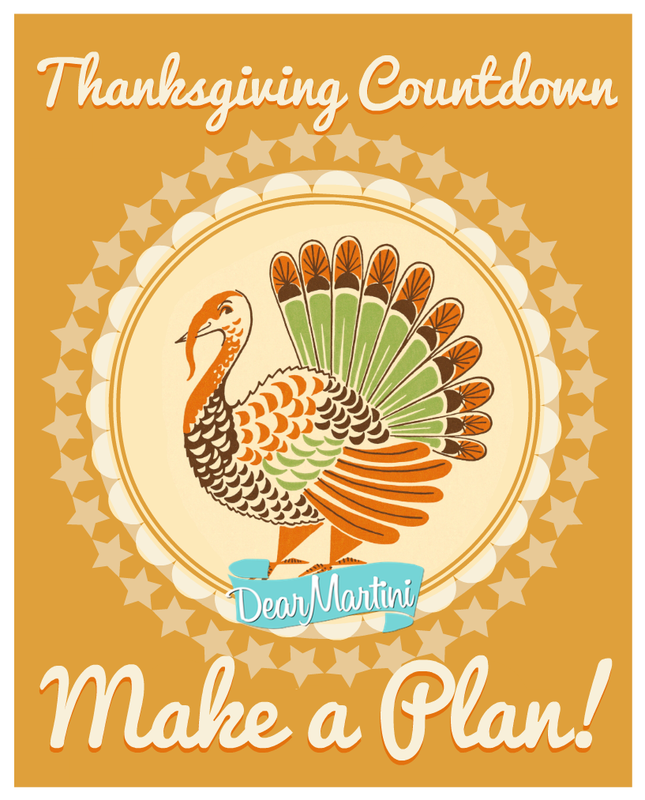 Thanksgiving Planning: Countdown to Turkey Day! To make the shopping more manageable, we divide our shopping into two trips. Friday or Saturday: Shop for ingredients you need to get started on recipes through Monday. Tuesday: Shop for remaining perishable items like fruit, salad greens, flowers, AND anything you forgot to pick up on your first trip. Dividing the list makes the first shopping trip easier and the second trip gives you the opportunity to pick up forgotten ingredients and perishable produce items that won’t last till the end of the week (and still look and taste their best.) Remember…avoid going to the store on Wednesday as if the Zombie Apocalypse has happened. If, after reading this you still need some extra advice and have some more specific questions, consider signing up for the Dear Martini Holiday Hotline! We’ll be on-call all week long right up through T-Day to answer your questions, fix kitchen emergencies and offer advice and encouragement! 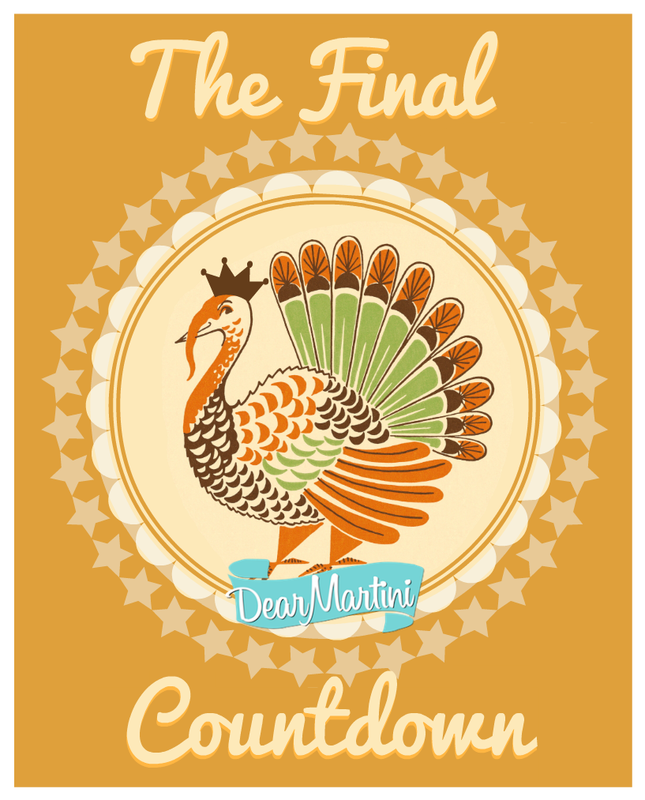 Sign up for it here: The Dear Martini Holiday Hotline. Browse through our Dear Martini Thanksgiving Playlist on YouTube. It’s chockfull of every how-to technique you’ll need to know for preparing your feast including how to carve the turkey! If your bird is frozen pick it up today –Check thawing times and start process and based on how much your turkey weighs. Refer to our previous post if you need a review on how to properly defrost a frozen turkey. Make pie shells if making pumpkin or pecan pie and freeze ( if you are feeling overwhelmed– delegate the pies now!). Make Cranberry Sauce and Vinaigrette. Refrigerate until ready to serve on Thanksgiving (woohoo– you don’t have to think about these again). Do any of your recipes call for toasted nuts? Toast the nuts, cool and freeze today. Planning on serving a soup? Make it today and freeze. Make stock for gravy and refrigerate (or freeze if you are tight on fridge space!). Pro tip: Chop all the garlic, onion, carrot, celery, shallots, leeks, etc. that you will need for every recipe and place in separate resealable plastic bags. Store in your crisper drawer in the fridge. This step really saves time– as you prepare your recipes for the rest of the week you will scoop out what you need and not have to stop to chop these ingredients. If you are using the Dear Martini Dry Brine recipe. Start the process tonight. 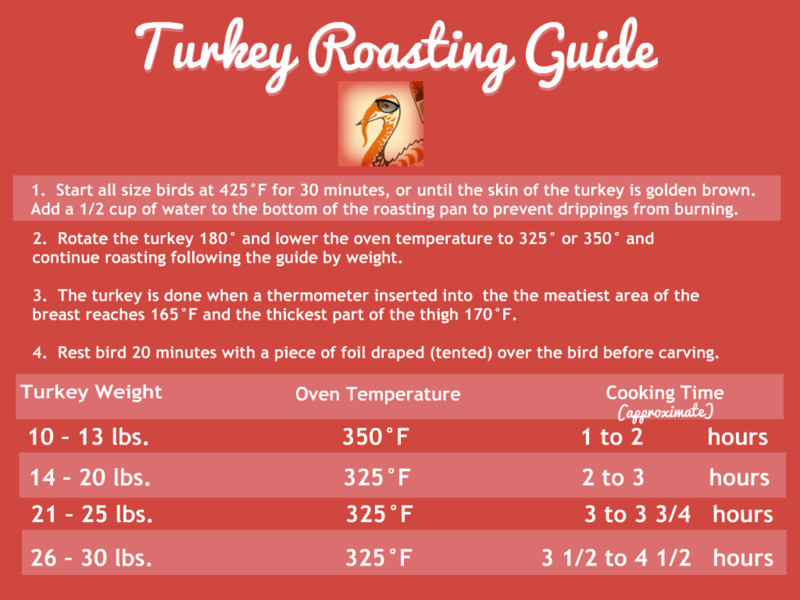 Double check the roasting guide for how many hours your bird will take to roast. Write yourself a reminder note and post it on fridge so you are already looking ahead to your timing for Thursday. Don’t forget to turn the bird over in the brining bag if you are using the Dear Martini Dry Brine recipe. If you are picking up your bird today you can do an abbreviated dry brine: follow the instructions for brining without turning the bird. Shop for produce and forgotten items. Make cornbread (we love Jiffy) or cut bread for stuffing. Clean the house and bathrooms. Pro Tip: Don’t even think about going to the store today! Imagine that all the roads and stores are crammed with zombies (… because, they are). We usually take the day off work and we order take-out for dinner. Follow brining instructions for Wednesday. Bake off pies — Pumpkin Pie or Pecan Pie. Make stuffing and refrigerate. If you are short on oven space, you can make, bake, cool, and refrigerate stuffing today. On Thursday, you take the stuffing out of the refrigerator about 40 minutes before the bird is done (to allow it to come to room temperature) and then reheat it in the oven once the turkey is out. If you have enough oven space that you can bake the stuffing from start to finish on Thursday– don’t worry about baking it today. Wash and trim salad greens , Brussels sprouts, greens, herbs, and any other vegetables. Wrap in paper towels and place in plastic bags. Refrigerate until needed. Make any side dishes that can be made in advance. Even if you can’t make the entire dish ahead look for steps you can do today — blanch green beans, seed pomegranates, sauté aromatic vegetables like onions, carrots, garlic, etc. Place serving dishes and serving utensils out on your sideboard. Set up coffee and set out coffee cups, dessert plates, and utensils. Set up wine and beverage station. Pro Tip: Wake up early and have a good breakfast! Get the turkey in the oven. and follow the roasting instructions for our Roast Turkey. While the turkey roasts: Prepare side dishes. While the turkey rests: Make the gravy, assemble the salad, bake or rewarm stuffing and casseroles. Pro Tip: Show off the turkey on a platter, take your pictures, but carve it in the kitchen. As soon as turkey has been carved– serve everything immediately. Have fun! Post your family photos and fabulous food on Dear Martini Facebook page. After dinner… Dishes can wait, everything else can wait, but leftovers need to be refrigerated IMMEDIATELY following dinner. You survived! Relax and eat yummy leftovers. Whew! This list can be a little daunting, but remember you are preparing a feast. Ask for help — don’t be shy about asking your family members for help! We’re almost one week out from Thanksgiving Day! 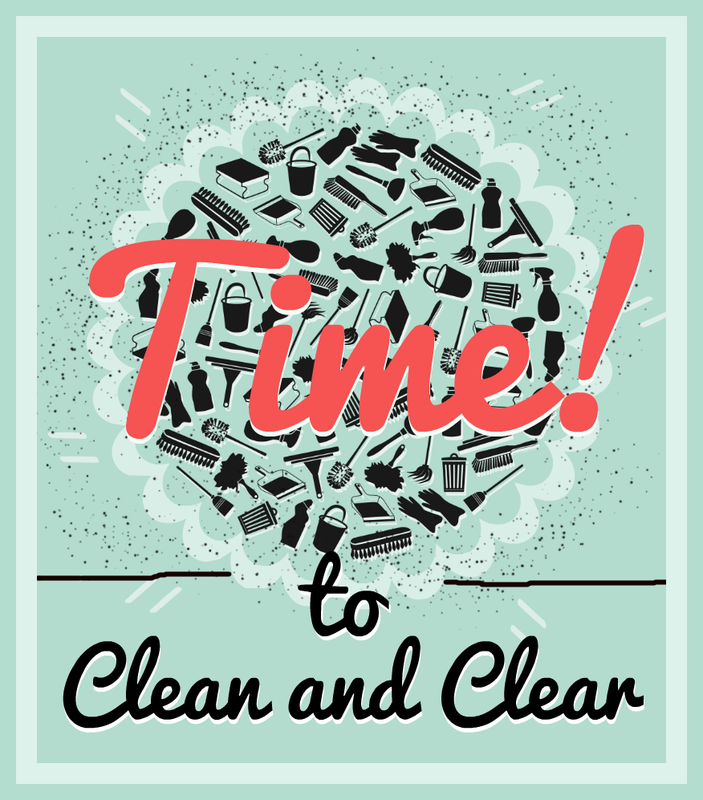 To be prepared for the upcoming weekend preparations, it’s time to start clearing and cleaning! Begin by imagining what the day of Thanksgiving will be like. Your guests will arrive at different times, bearing dishes, gifts or beverages. Now is the time to plan for their arrivals. If you’ve delegated folks to bring a side dish or dessert item for dinner, it’s best to have a landing place where they can be safely put out of the way from your work area. If some guests bring wine or other beverages, designate where they can place their bottles — a cooler, ice bucket or extra fridge space in the garage. Inevitably, without a plan for where things go, your guests will awkwardly hand you something just as your hands are stained from peeling and slicing beets. Or, better yet, they find a place to set down their special bottle of wine hoping you find it… which you do, the Saturday after Thanksgiving when you’re putting the house back together. Start with clearing space. Every surface area has the potential to serve as a landing pad for pot-luck dishes, hostess gifts, floral arrangements or bottles of wine. Remove as much clutter from your dining room sideboards, side counter tops in your kitchen and make as much room as possible. Put the decorative jars and baskets away. Put. Them. Away. Leave out one vase in case someone arrives with flowers. We promise: someone will arrive with flowers. Clear out space in your fridge and freezer. If your cousin Patty says she’s bringing apple pie for dessert, you can count on someone wanting to bring ice cream. Save yourself the hassle and make room in the freezer now. Clear out the clutter. Piles of magazines, miscellaneous mail, or unfinished projects have no place in the kitchen, dining room or family room during Thanksgiving Day Prep. Once you’ve cleared as much work space as possible, it’s time to clean. You’ll be surprised at how efficient and organized you’ll be if you start with a clean kitchen and dining room. And, if it makes you feel any better… we are doing the exact same thing this week at our houses! 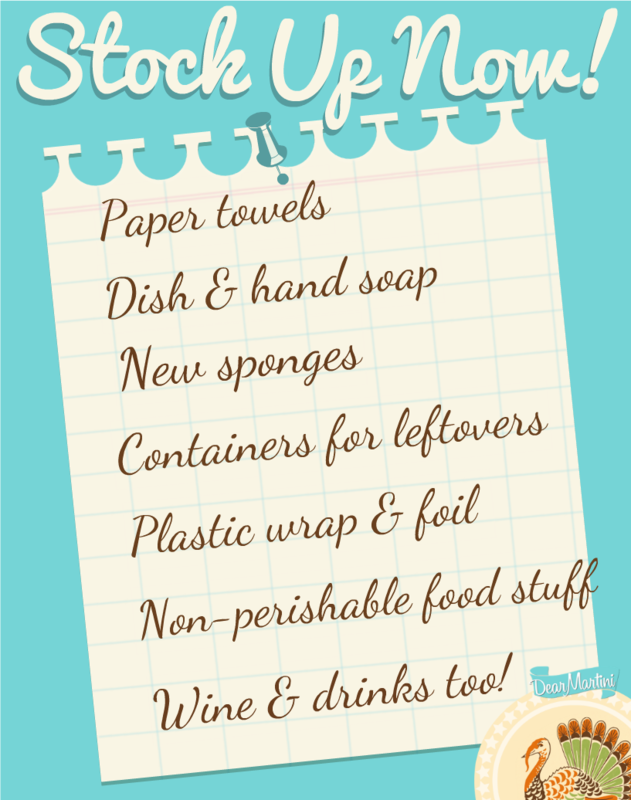 Thanksgiving Planning: Time to Make a Plan and Stock Up! When planning our Thanksgiving feast sometimes the “to do list” can seem a little daunting even for us. We try to spread out as many of the chores over the next couple weeks to avoid the last minute Thanksgiving panic. We ordered the turkey last week, if you haven’t done so already now is the time. This week is all about making lists, writing down a game plan, and stocking up. Yep, we take the time to write ALL this stuff down (so we don’t forget anything) and post it on our fridge and delegate tasks (so everyone else in the family can help.) We can’t stress this enough– make a plan! 1. Take a deep breath. Open a bottle of wine or make a pot of tea. Put on some nice music and sit down in a quiet spot. a) Stuff that can be made ahead of time. For example, you can make cranberry sauce the minute you see fresh cranberries at the market. Toasting any nuts you’ll be needed ahead of time… pie dough, Store the made-ahead items in your freezer, in air-tight containers and clearly labeled. 3. Make a shopping list. Organize the list into 2 categories: fresh ingredients and non-perishable ingredients. Buy all non-perishable items this week when you do your regular grocery shopping. Any of the shopping you can knock out now will mean less to pick up at the store the closer you get to the Big Day. If you’ve ever gone through the agony of shopping on the Wednesday before Thanksgiving… you’ll never make that mistake again!! 4. Double-check your kitchen and table setting supplies. Do you need a roasting pan? Don’t have a platter large enough for your turkey? Now is the time to borrow or buy any supplies you need. Do you need to wash or iron a tablecloth or napkins? How about polish silver (ugh)? These are all tasks we do this coming weekend while watching our favorite movies. 5. If you are really ahead of the game– make your pie dough and pie shells this weekend and freeze. Better yet, ask one of your guests (the one you trust the most) to bring the pie! Thanksgiving Planning: Time to Order the Bird! 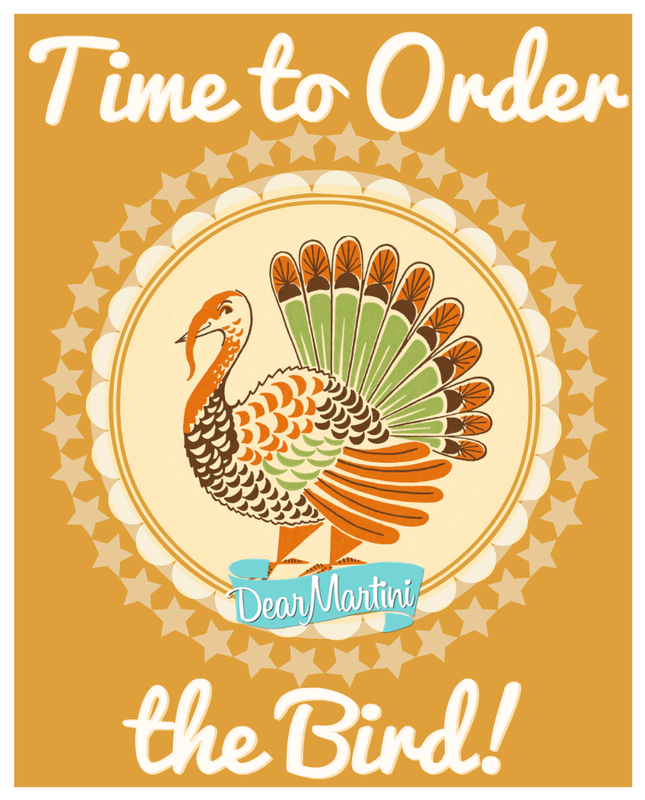 It’s the first week of November, and you know what that means… time to order your bird! The Thanksgiving Turkey is the centerpiece of any Thanksgiving Feast. It’s the main course, the entrée… the piece de resistance… the real deal… the Big Kauhuna… so don’t treat purchasing the turkey like it’s an afterthought! Take a few extra minutes to decide on what kind of bird you want, then pick one out that’s the best you can afford. Starting off with the right bird – you’re halfway there to a delicious Thanksgiving! Here are some questions to think about that might help you choose the right bird. 1) How many people are coming to dinner? The general serving rule is 1 pound of turkey per person. This factors in for bones, too, so if you’ve got 12 people coming over, choose a bird that’s 14 – 16 pounds so you’ll get to enjoy some leftovers and second helpings. 2) How are you cooking the turkey? Are you doing a traditional roast turkey? Deep-frying? Split-roasting or grilling? For most cooking methods, it makes little difference between fresh and frozen. A frozen bird, however, requires extra time for thawing. So keep that in mind. 3) Do your guests prefer white meat or dark meat? Lucky you! You get to be the provider of all things delicious and bountiful! In some households (well, maybe just ours), the majority of folks prefer dark meat… which means there is never enough dark meat carved right off the turkey. Consider buying a few extra turkey legs so there will be enough of the succulent dark meat to go around. Conversely, if the household prefers white meat, buy an extra breast to make everyone happy! 4) Fresh or frozen bird? There is no shame in purchasing a frozen bird, as long as it’s from a good-quality producer. Just keep in mind you will need time to thaw the bird. It will take a 10-pound turkey 1 day to thaw if kept in a refrigerator at or below 40°F. For every 5 pounds of frozen turkey, add another half day. 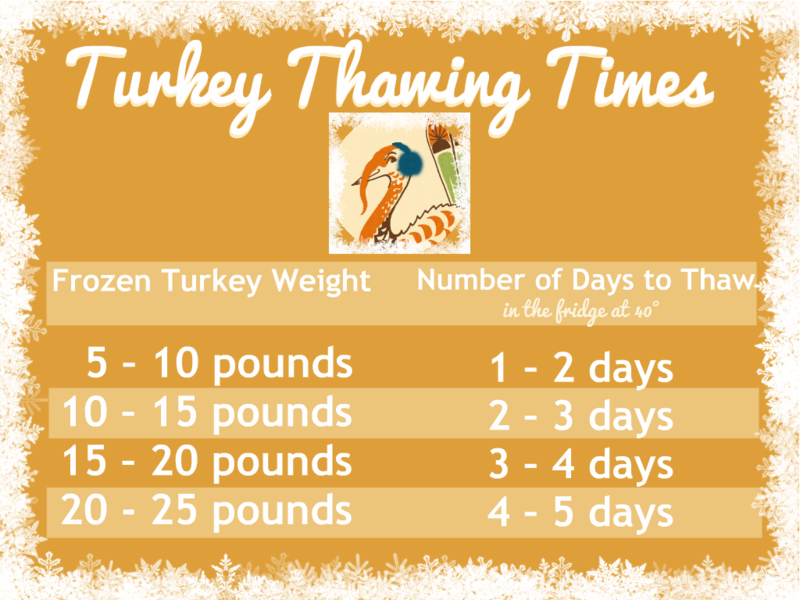 See the Turkey Thawing Chart for more information. 5) Natural? Organic? Kosher? Help!!! Regular — Plumped (or pumped!) with anything including: water, salt, chicken fat, broth, and or BUTTER. Natural — Minimally processed and contains no artificial ingredients or colors. Organic — Must follow strict USDA standards for organic production and processing including access to the outdoors, no antibiotics or growth hormones, and fed organic feed. 6) What the heck is a Heritage Turkey? Ah, the Heritage Turkey…. Remember back to the illustrations from your schoolbooks depicting people dressed up like Pilgrims and Indians enjoying a Thanksgiving feast? Think about how that turkey look in the picture: smaller breast, larger wings, legs and thighs in equal proportion to the breast. Now think about the commercial ads you see for Thanksgiving Turkey in your local newspapers, magazines and television ads. Commercially-raised turkeys today have been bred to yield larger breasts, and smaller wings and legs. They are raised to be grown quickly, then processed to be available in the frozen bird bin immediately after Halloween. Heritage Turkeys, however, are farm-raised more naturally and slowly in the exact opposite way industrially raised birds are. Heritage birds might actually be specific breeds with names like Bourbon Red or Standard Bronze and are more similar to wild turkeys. According to chefs, the meat from Heritage turkeys is tastier, a little gamier, and healthier given the ways they are fed and raised. They can also be more expensive to purchase, but since the bird is the star of the meal we allow ourselves to splurge a little more to get a better quality bird. This week, we are announcing TWO essential tools to get your Thanksgiving Holiday off to a great start. Our YouTube Channel is bursting with plenty of great videos that highlight every technique you need to know to cook your Thanksgiving dinner – from boiling potatoes, to making cranberry sauce and pumpkin pie… all the way to carving the roasted turkey! Be sure you subscribe to our channel so you’ll get immediate updates when we add new videos!